Though produced for use by body shops, it turns out that Tite-Spot Welders are the best spot welders available for many diverse manufacturing and fabrication spot welding applications. From auto body markets, customers in other transportation markets followed. From Automotive OEMs to Rail Car fabricators to Aerospace manufacturers. S. Diamond Steel welds wire to steel posts to create a wire lattice, part of our Architectural Products marketplace. 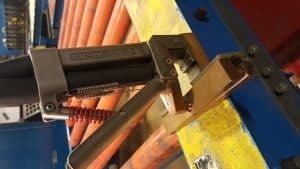 Anyone doing fabrication spot welding of steel or stainless steel components as part of their end product is a natural candidate for a Tite-Spot Welder. Moerke Display, a manufacturer of point-of-purchase displays, uses our welders to weld sheet metal to steel tubing in a product designed to be attractive to shoppers.